Naturally, the first settlers to come to this quiet little river valley [in what we now know as Canal Fulton] were Native Americans. A unique combination of factors would make the Ohio wilderness an ideal place for these early inhabitants to call home. One of these factors, the Tuscarawas River, would continue to be a major contributor to area settlements. The Tuscarawas begins in northern Stark County (just south of the trans-continental divide) and winds its way westward and south before opening up into the larger Muskingum River. The Muskingum then contributes to the Ohio River which spills into the Mississippi, bisecting the entire country. These systems of natural waterways were convenient and essential transportation routes for the establishment of not only these first settelments, but indeed many settlements since. Through the past centuries,	various Native peoples have inhabited the Tuscarawas River watershed. It is said that the Delaware Indians regarded this area the best in northeastern Ohio for fishing. While such tribes would be displaced in ensuing years, traces of their	culture remain throughout the area today. "Ohio," "erie," "tuscarawas," and many other words have found their way into today's lexicon. Inspiring, harrowing and all	manner of other complex stories	surround area history leading up to the Battle of Fallen Timbers and the ensuing Treaty of Fort Industry. 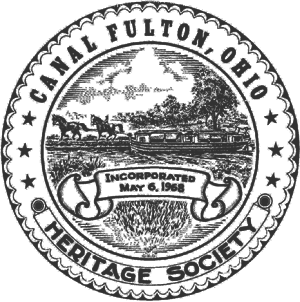 Beginning in the late 1700's, leaders of the newly-founded United States of America were eager to see the Ohio Territory tamed and settled and in 1800, the lands east of the Tuscarawas River were surveyed. With the signing of the Fort Industry treaty in 1805, Ohio's Native Americans agreed to relinquish their claim to the lands west of the Tuscarawas. Thus, in 1807, the lands beyond the river were surveyed as well. The frugal and pioneering spirits who resettled this portion of the river valley preferred the newly surveyed lots on the western bank - these being smaller, more affordable and whose soil was regarded as better suited for farming than that on the eastern side. It was shortly there after, in the year 1814, that the village of Milan was established. In these early 1800's, many small towns were springing up around Ohio. Names like Rome, Dresden, Berlin, Dublin, Milan seem to indicate that while town founders knew the reality of their meager locality, they still recalled the great cities of Europe and perhaps basked in the hopes of such renown for their new home. Life in early Milan no doubt had its challenges. It was a new village inhabiting an area of country that was regarded as wilderness a mere decade before. It enjoyed neither the industry, economy nor access to transportation afforded by cities along larger bodies of water like the Ohio River. However, this would soon change as legislators in the State Capitol were working out the minutia of Ohio's canal system. Anticipating the economic boom that our neighbors in New York experienced from their Erie Canal, plans for internal improvements began flying all around our infant state. 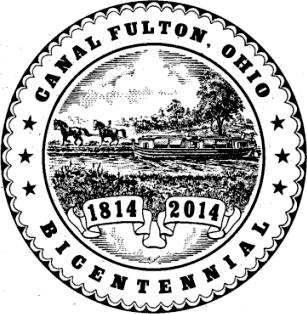 It was at this time, in 1826, that the village of Fulton was drawn up. Local innovators were expecting commerce and industry to flow forth from the Ohio & Erie Canal. The route of the canal through this portion of Stark County was then set to follow the	eastern bank of the Tuscarawas,	and Fulton was expressly laid out to parallel this major man-made waterway. It was something of a gamble as this portion of canal would not be completed for another year and the first canal boat wouldn't pass through the village until 1828. Never-the-less, the expectations and designs of these entrepreneurs were not in vain! Soon the population, commerce and industry brought by the canal would be realized, not just here in Stark County, but throughout the state and beyond. Fultonians, with their immediate access to the canal, had an advantage over their neighbors in Milan. However, even communities without direct contact to this new trade route would benefit from the prosperity brought by this modern transportation network. Such affluence is evident for in 1832, directly south of Milan, the hamlet of West Fulton was founded. It too would reap the bounties of this man-made waterway. Certainly area residents profited from their connection with this transportation hub. Eventually, Fulton's success would consume its smaller neighbors and by 1853, the three villages would merge into one. In 1814, who could have thought that the little village of Milan would be enjoying the successes of an important inland port? The Ohio & Erie Canal brought the opportunities for businesses and industry to this once wilderness. These in turn attracted labor, which brought families, which spurred on the development of service industries, cultural pursuits and education. For certain, Fulton was a bustling place! Indeed, it was out of appreciation for this hustle and bustle that the prefix of 'Canal' was added to Fulton. Reportedly, wagons would line up all the way from the Wayne County line, about 3 miles away, waiting for the	opportunity to off-load thier produce in the Canal Fulton market. Farmers, even from perhaps as far away as Ashland, may wait for hours to sell their grains and goods here. These, in turn, were shipped to larger markets in Akron, Cleveland and far beyond! Our ancestors have long known that moving goods and people by way of water is far more efficient than by land. Finally, with these canals this young nation had the transportation system necessary to support its growing needs. Because of the system of rivers and canals that crisscrossed throughout the country, rural Ohio farmers could now ship their produce to feed the bustling burgs along the eastern and southern coasts. With many of Canal Fulton's businesses being either 'middle-men' within this shipping chain or providing services to the canaling industry, truly the Ohio & Erie Canal brought prosperity to all. However, by the 1850's, only a few short decades after "canal fever" had swept the nation, the canals came into direct competition with another technological and engineering marvel - the steam powered locomotive engine. Throughout the state (and indeed the rest of the country) the business of transportation began giving way to this newest form of hydraulic power. Despite these shifting tides, Canal Fulton would continue reaping the benefits of its geography, not from its water resources, but this time from those found in its land. This river valley and much of the surrounding countryside would be found rich in coal. More than 20 coal mines would dot this northwestern corner of Lawrence Township and many other mines would be established throughout neighboring communities. 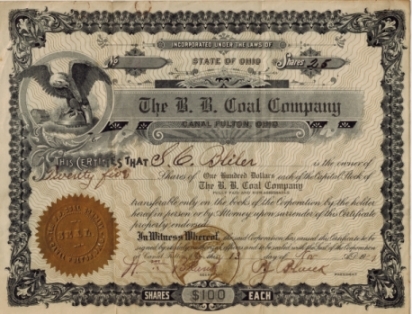 The growth of the coal business would stoke the flames of industrial production throughout this area (as indeed the nation). Canal Fulton businesses adapted to these changes and by the late 1800's, focus on the canals had given way to the mechanized demands of coal mining and other manufactories. 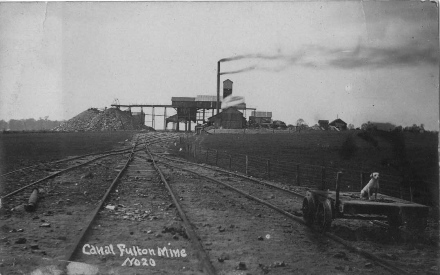 However, even this chapter of Canal Fulton history would be short-lived as Fultonians came to realize their coal fields were not inexhaustible. Both the canal and coal eras entered with a boom; yet, within a few short decades they would exist only as smoldering remnants. While their presence and legacy would remain, within the early 1900's, both industries were all but extinguished. While Canal Fulton lay within the network of steel rails of the locomotive, the Iron Horse found hubs in other area cities like Akron, Canton and Massillon. With the canals and coal in decline local business again needed to redefine. Though some industry would remain in the village, little-old Canal Fulton just couldn't compete with the opportunities found in its larger neighbors and through the early 1900's, the town's population would decline. 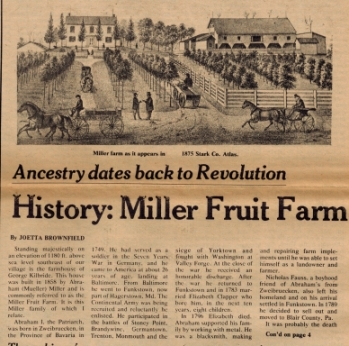 Despite all its other ups and downs, farming (that age-old vocation on which Milan's first	residents carved out their livelihood) would prove to have been the area's most sustainable industry throughout these several centuries. Never-the-less, in the mid 1900's, Canal Fulton would once again be caught up in the rising tides of national events. Throughout World War II and in the years following, industrialism would	bolster the economy throughout these United States. As much of the world was rebuilding itself, US products would pour from manufacturing floors inorder to meet this world demand. These post-war boom years would also see advances in automotive technology and increased wages. Such factors afforded many laborers the ability to live even further away from the dirty, noisy factories where they worked. At the end of the day, these newly empowered workers could now leave behind the urban bustle and commotion of the city. Little towns like Canal Fulton would now reap the benefits from such sub-urban sprawl. Indeed, through the latter half of the 1900's, Canal Fulton would become a 'bedroom' community for its larger neighbors like Massillon, Canton and Akron (which were now an affordably short commute away). Within the last half of	the 20th century, Canal Fulton's population would steadily grow. Modern day Canal Fulton retains much of its historic character. While some structures have changed, many still showcase building styles popular more than 100 years ago. Though a mere 100 years is as a drop in the bucket*, none-the-less, Canal Fultonians can - and should - be proud of our historic town. Indeed, such community pride spurred Village administrators, the Canal Fulton Heritage Society	and other businesses and residents to pursue entry of the town onto the National Register of Historic Places. 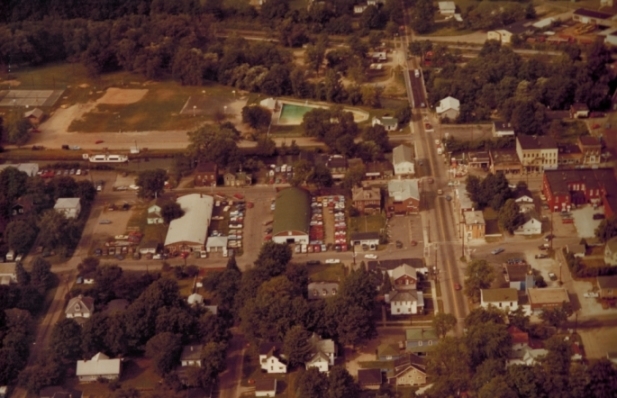 In the 1970's	(with more than 90 buildings included inside the district) downtown Canal Fulton was awarded the honor of being listed on the historic registry. In compliance with this new status, Canal Fulton's Historic Preservation Commission was established under village ordinance to retain the historic character of downtown and preserve it for future generations*. Through the end of the 1900's, the Village continued growing and at the turn of the new century, Canal Fulton had reached the population level allowing it to incorporate. On March 30, 2001 (with a population of 5,061), Canal Fulton shed the title of "Village" and became a City. Since then, City personnel, the City's HPC, the Heritage Society, and many other concerned businesses owners and citizens have worked hard to retain the charming historical character that has attracted so many people to this community. Certainly with a quick glance around town these past years, one can see the care and investment that many residents have been putting into the restoration of the town's old buildings. We certainly can't applaud these efforts enough! Throughout the centuries, this area has been blessed in a variety of ways. Inhabitants have long enjoyed the natural resources and wildlife in this river valley. The area has also been fortunate to be directly linked to a major interstate transportation route. But one blessing that certainly cannot be overlooked, or underestimated, is its dedicated residents. This community would come together in many ways through the years. The incredible success of the town's Sesquicentennial, as well as Olde Canal Days Festivals, and many other area events are proof of the community's dedication to celebrating and preserving its history. 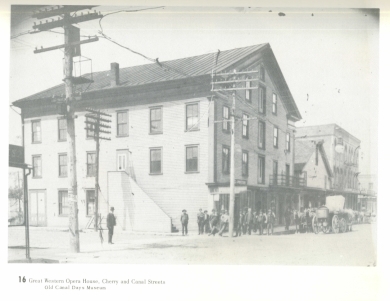 Many community clubs and organizations (Rotary, Jaycees, Lions, just to name a few), businesses and residents have, throught the years, all worked together to foster a spirit of cooperation and common concern for this historic town. May the dedication and accomplishments of all these civic-minded citizens (past and present) continue to be an example to us all! Residents today continue to enjoy the charming small town nature of this historic community. Over the years, Canal Fulton has seen a variety of quaint shops and restaurants occupy its historic buildings and the same is true today. Stop by and see for yourself that Canal Fulton is "a great place to work, play, live and give*."